The art of egg decorating dates back to pagan times when colorful decorated eggs were a symbol of spring as well as holiday celebrations. Today, just like we did a long time ago, egg decorating provides fun and entertainment for people of all ages. Traditionally, people just dyed eggs in different colors. But we don't have to always do the same old thing with our eggs. Get your creative juices flowing and decorate your Easter eggs in all sorts of cute ways. You can make your eggs look like animals, your favorite characters, people, or any old thing that you want them to look like. Find some creative egg decorating ideas below. Pierce each end of an uncooked egg (cream, tan or white) with a needle or pin. Blow through the hole at one end of the egg, catching the contents in a bowl. (Contents may be used for cooking or baking). If there is difficulty in blowing eggs, make the hole a little bit larger. Eggs are now ready for painting or dipping in egg dye. Cut a circle of thin cardboard or construction paper, as in Figure A. Cut a slit, as indicated by broken line, and cut out center (shaded area). 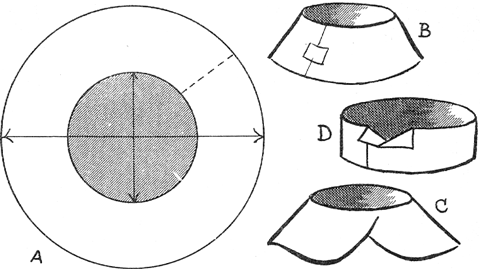 Overlap cut ends of paper and fasten with Scotch tape, as in Figure B. Front of collar may be rounded off, as in Figure C. Or cut a strip of cardboard 1" wide and long enough to fit around bottom of egg. Overlap ends and glue. Bend down corners to make wing collar as in Figure D.
It is a tradition on Easter to dye eggs as Easter egg decorations. Instead of going the traditional egg dying route, how about instead turning hard boiled eggs into animals or people characters or even Humpty Dumpty. You can even use paper, ribbons, felt, or other crafts items. Just don't use things that will get into the egg when eaten, such as glitter. If you don't know how to draw animals well...go to my cartoon animal drawing tutorials here. Select an egg that will fit a cupcake paper liner. Hard boil your egg and cool. Print out a chicken head outline here or draw your own chicken head. Cut this chicken head from yellow crepe paper. Cut it double and with the grain of the paper. Stuff a little cotton inside the head to fill it out, as pictured in figure 1. Paste in place on the egg. 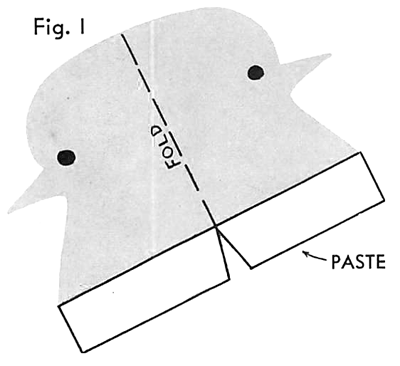 Then cut two wings and a tail from the yellow crepe paper, as pictured in figure 2. Paste in place. 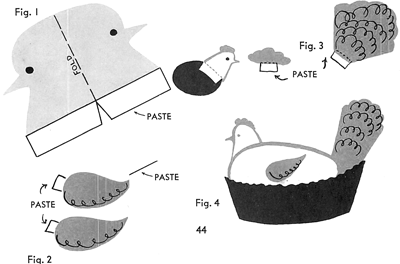 Make a comb (the part on top of the chicken's head) from red crepe paper, as pictured in figure 3. Paste in place on the egg. Fill the cupcake liner cup with small colored candied eggs. Then set the hen / chicken on the nest, as pictured in figure 4. Before dipping a large white egg in dye write upon it with melted wax (with parental help as not to burn yourself) the words "A Happy Easter." If you can't do this, then use crayons as the wax. The dye will not color the waxed letters. After the dye bath, remove the wax. The words will stand out in clear white on the dyed egg. Use the same method to make a picture on an egg. Engraving Eggs Instead of merely dyeing them as you usually do, wouldn't you like to have some engraved Easter eggs? Engraving them will give them raised letters or design. This is done by a simple process. Remember, if you are going to eat the eggs, you should boil them hard first. The engraving process begins by writing with a piece of beeswax the name of each member of your family on separate eggs...or by drawing designs with it. The results will be equally effective. Next, put the eggs in a bowl of vinegar and leave them there for 2 or 3 hours. At the end of this time, you will have the design showing very plainly in a raised-design effect. The acid of the vinegar eats away the portions of the egg which are not coated with beeswax. You can get the same effect by melting paraffin and penning or brushing it on the egg before dropping it into the vinegar. 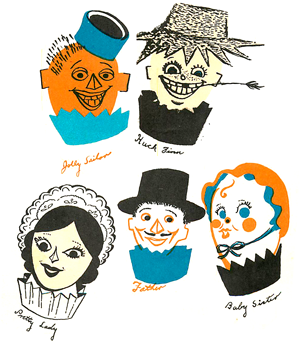 You can have a great deal of fun creating different egg characters for each member of your family. Place each in a cupcake liner cup that wears a fluted ruffle. To make these surprise Easter eggs use ink, paint, pieces of lace, tissue paper, bits of cloth, and lace paper doilies. The pictures above will give you ideas to to make these egg characters for Your Mom, dad, Sisters, Brothers, Uncles, ets. This is a lot of fun to show people at the Easter Dinner Table. Make a Pop-Up Easter Eggs Card - Learn how to make this card with a pop out nest filled with paper eggs....perfect for Easter. Easter Egg Head Dolls - Turn an Egg into the head of a doll - perfect for guests for Easter Breakfast or Dinner. Also great for sleepovers where kids can make an Egg Headed Doll and then eat them later. Homemade Easter Egg Dye: How to Make Easter Egg Dye from Things in your Cupboards - It does take a little more effort but the effect can be some truly beautiful eggs that are unique and truly yours. The best point about this craft is it brings your children’s crafts into the kitchen, and as any chef or baker knows, you can create some true masterpieces on a stove. Blown Egg Bird in a Bird Nest - Make a Blown Egg, Paint it and add paper bird features. Then make the bird cage with berry containers. 3D Easter Egg Paper Craft Ideas - Follow these instructions to create a 3D Easter egg decoration. Baby Megg Egg Crafts Project - Make this adorable Baby Megg from a hard-boiled egg and other supplies. Batik Eggs Easter Craft for Children - Use the batik technique to decorate eggs for Easter. Bee Egg Crafts Idea - In this craft, children will turn an egg into a flying bee. BloPen Easter Eggs Craft for Kids - Learn how to decorate Easter eggs from BloPens in different colors. Blow Out Eggs to Make Hollow Eggs for Easter - This tutorial will show you how to blow out eggs to make hollow Easter eggs. Bluebird Egg Arts & Crafts Ideas - Kids will learn how to blow out an egg then turn it into a bluebird. Boiled Egg Easter Bunnies Activity for Kids - Learn how to make edible Easter bunnies from hard boiled eggs. Candied Eggshells Easter Craft for Kids - Recreate the look of cracked egg using empty paper egg carton, acrylic paints, yellow jelly beans and Easter basket grass. Coffee Filter Easter Egg - Find out how to make colorful Easter egg decorations from coffee filters. Confetti Eggs Easter Craft - Making Confetti eggs is fun for children of all ages. Confetti Filled Eggs Easter Craft for Kids - Find out how to make confetti filled eggs from raw eggs, food coloring, paper confetti and tape. Cool Crayon Colors Easter Eggs Crafts Ideas - Learn how to use wax crayons to create eggs. Crayon Resist Eggs Activity - Learn how to make these crayon resist eggs. Crayon Resist Eggs Easter Activity - Learn how to make these cool Crayon Resist Easter Eggs. Creative Ways to Dye and Decorate Easter Eggs - Here are 13 ways you can decorate Easter eggs with your kids. Cress Egg Heads Easter Craft Activity for Children - This tutorial will show you how to make Cress Egg heads from eggshells and a few other supplies. Daddy Deggster Egg Crafts Activity - This is a great Easter gift for all the fathers. Decal Dyed Easter Eggs Craft - Find out how to dye your own Easter eggs with patterns. Decorating Easter Eggs with Glitter - This video tutorial will show you how to easily decorate Easter eggs with glitter. Decoupage Designs Easter Eggs Crafts - Find out how to design keepsake Easter eggs. Decoupage Surprise Window Eggs Craft - Surprise your friends with these special eggs. Devilled Easter Egg Chicks Craft for Kids - Find out how to make this cute and delicious devilled Easter egg chick. Dripped-On Eggs Easter Eggs Crafts - All is needed to make these dripped-on eggs are rubber cement and egg dye. Dying Easter Eggs Craft Activity for Kids - Here are a few ways you can dye your Easter eggs. Dyed Eggs & Easter Egg Tree Craft - Find out how to dye Easter eggs and make a special Easter egg tree. Easter Activities: 20 Easter Egg Decorating Ideas - Here are 20 ways you can decorate eggs for Easter. Easter Egg Bunny Easter Craft for Kids - Follow these instructions to create these adorable Easter bunnies. Easter Egg Chicks Crafts Project - Learn how to turn an egg into an Easter Chick. Easter Egg Crafts - Direction on decorating eggs for easter. Easter Egg-Decorating Ideas - Here are a few Easter egg decorating ideas for the whole family. Easter Egg Dolls - Create a cute Easter Egg doll from egg shells, muffin cups, ribbon, and other supplies. Easter Egg Door Hanger Craft - Make an adorable Easter door hanger using paper mache ovals, dowel, acrylic paint, jute, thumbtacks, old toothbrush and acrylic sealer spray. Easter Egg Heads Crafts Idea - This is a fun and creative Easter project for the young and young at hearts. Easter Egg Holder Craft Idea - Learn how to create a Easter Egg Holder by following these instructions. Easter Egg Mosaic Pin Craft Activity - Make a special mosaic pin from all your left over dyed Easter eggs. Easter Egg Mosaics Arts & Crafts Project - Make mosaics art from all those colored Easter egg shells. Easter Egg Sweatshirt Crafts Activity - Find out how you can make this special Egg Sweatshirt for Easter. Easter Tree Craft - Make the perfect egg tree for Easter! It’s a fun craft that your children will love to make. Easy Egg Shell Candles for Easter or Birthdays - Make beautiful egg shell candles decorations for your home this Easter. Easy Sponge Painted Eggs Easter Craft Activity for Kids - Decorate your Easter eggs using this simple sponge paint technique. Egg Beads Jewelry Easter Craft for Kids - These jewelries are perfect to wear on Easter Sunday. Egg Centerpiece Craft for Kids - Crayola.com shares with you the best Easter craft for children. Egg-Citing Egg Creatures Craft - Use Crayola products to create Egg-citing Egg Creatures. Egg-Citing Styrofoam and Tissue Paper Easter Crafts Project - Find out how to make this cute bunny with its basket of eggs. Egg Dyeing: Thumbprints Technique - Decorate your Easter eggs using your thumbprint and acrylic paints. Egg Holders Crafts Ideas - Learn how to make adorable holders for your Easter egg. Eggshell Bouquet Crafts Activity - This is a great way to decorate your Easter table. Eggshell Mosaic Picture Craft for Kids - Make beautiful mosaic art from egg shells, food coloring, paper, glue and a pen. Eggshell Posy Vase Craft for Kids - Follow these instructions to create a beautiful eggshell posy vase for Easter. Eggshell Mosaic Picture Art - Here is a fun way children can recycle all those colored Easter eggs by using their shells for mosaic art. Eggshell or Egg Carton Tulips Craft - Make a beautiful bouquet of tulips from egg shells or egg cartons. Eggshell Plant Pots Easter Craft Activity - Find out how you can use eggshells are plant pots. Egg Topiary Craft for Kids on Easter - Learn how to make a special Egg Topiary decoration for Easter. Egg Tulips Crafts Activity - Follow these instructions to create tulips from three blown dyed eggs. Glitter Easter Eggs Arts & Crafts Activity Idea for Children - This is a very simple and elegant way to decorate Easter eggs. Grandpa Gregg Egg Crafts Activity - Find out how to turn a brown and white hard-boiled eggs into Grandpa Gregg Egg. Green-Haired Eggheads Craft Idea - Find out how you can make green-haired eggheads by following these instructions. How to Decorate Easter Eggs with Stickers - This video tutorial will show you the best way to decorate Easter eggs with stickers. How to Make a Felt Easter Egg Pouch - Find out how to make a felt egg shaped pouch for your Easter eggs. How to Make Faux Faberge Jewelled Eggs - Follow these instructions to create a beautiful faux Faberge Jeweled egg for Easter. How to ... Make Leaf Print Eggs Activity for Children - Learn the simple technique of making leaf print Easter eggs. Humpty Dumpty Egg Easter Craft Activity - Find out how to turn a plastic egg into Humpty Dumpty! Jeweled Easter Eggs Crafts Ideas - Learn how to decorate Easter eggs with jewelry and glitter paint. Lots of Dots (and Lines) Easter Eggs Decorations - Kids will have a blast decorating Easter eggs using glitter, colored sad and egg eye. Make a Hatchable Dinosaur Egg - Find out how to make huge hatchable dinosaur or Easter eggs. Making an Easter Egg Diorama - Learn how to make an Easter Egg Diorama. Marbelized Easter Eggs Craft for Kids - This lesson will show you how to make funky marbleized designs on easter eggs. Marbled Eggs Easter Craft Project Idea - This tutorial will show kids how to make marbled looking eggs for Easter. Mom Peggy Egg Crafts Project for Kids - A fun craft where children can make an egg character of each member of the family. Mouse Egg Arts & Crafts Project - Learn how to turn an egg into a colorful mouse in a few simple steps. 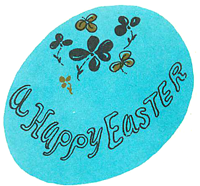 Napkin Applique Easter Eggs Crafts Idea - Follow these simple instructions to create Napkin Applique Easter Eggs. Oil and Food Coloring Marbled Eggs Craft - Make these marbled eggs by using food coloring and a little cooking oil. Origami Box for Mini Easter Eggs Craft for Kids - Learn how to fold paper to make a special box for your miniature Easter eggs. Paper Maché Easter Egg Crafts Activity Ideas - Find out how to make a big Easter egg using the Paper Mache method. Paper Mache Easter Eggs Craft Idea - Make this Easter egg piñata for the children to hit after Easter dinner. Papier-Mâché Eggs Arts & Crafts Project - Hide goodies for the little kids in this huge Easter egg. Patchwork Easter Eggs Arts & Crafts Idea - A project that creates a trendy, beautiful Easter egg. Pig Egg Crafts Ideas - Follow these instructions to turn an egg into a pig. Plastic Egg Bunny Easter Craft for Kids - Learn how to make an Easter Bunny from a plastic egg and a few other supplies. Polystyrene Egg Bunny Easter Craft Activity for Kids - Here are instructions for turning a large polystyrene egg into a cute Easter bunny. Polystyrene Egg Chick Arts & Crafts Easter Activity for Kids - Here are instructions for turning a large polystyrene egg into a cute chick. Quilted Easter Egg Craft - Make a quilted Easter egg from a Styrofoam egg, fabric scraps, butter knife and a pair of scissors. Raggedy Easter Eggs - Make a cool raggedy egg project for Easter. Ribbon Egg Crafts Project - This is a great and easy Easter craft for toddlers and preschoolers. Ribbon Eggs Craft Activity - Find out how you can delicately decorate Easter eggs with ribbon. Rubber Banded Eggs Easter Crafts Ideas - Twisting bands around an egg can be challenging, but the result is a snappy, colorful creation. Rubber Band Eggs Craft for Kids - Learn how to make these Rubber Band Easter Eggs. Russian Imperial Eggs Arts & Crafts Project - Use Crayola products to create a few Russian Imperial Eggs. Sequin Egg Easter Arts & Crafts Project Ideas - This tutorial shows kids how to decorate an Easter egg with sequins. Scrunched Tissue Paper Egg Craft for Kids - Find out how to make an Easter egg from card, glue and colored tissue paper. Sheep Egg Crafts Activity - Turn an egg into a sheep using egg dye, cotton balls, brown paper, pipe cleaners, crayons and black marker. Simply Smashing Easter Egg Shells Craft - Decorate your Easter eggs using other eggshells. Speckled Easter Eggs Craft Idea for Kids - This is a fun but messy way to decorate your Easter eggs. Spring Chick Surprise Craft - This would make a great Easter gift for someone special. String Art Easter Egg Ornament Craft - Decorate your home for Easter with these beautiful egg ornaments. String Eggs Arts & Crafts Activity for Easter - These string eggs makes a beautiful Easter decoration. Superegg-man Egg Craft for Kids - Turn an egg into superman in a few simple steps. Swirled Easter Egg Designs Craft - This is a fun and messy way for kids to decorate Easter eggs. Tape and Paint Arts & Crafts Activity for Kids - Find out how to decorate Easter eggs using masking tape and acrylic paint. Tie Dyed Easter Eggs Craft for Kids - Learn how to tie dye Easter Eggs using an old shirt and food coloring. Tissue Paper Easter Eggs Craft - Decorate your wall or window with these beautiful tissue paper Easter eggs. Tissue Paper Egg Arts & Crafts Activity for Kids - Decorate your Easter egg (polystyrene egg) using tissue paper and PVA glue. Wallpaper Easter Eggs - Make a beautiful egg with wallpaper, lace, and other decorations.